OK ..... I admit it's off topic. Maximum speed: 302 mph at 25,000 ft.
Span: 103 ft. 9 in. Length: 74 ft. 9 in. Height: 19 ft. 1 in. that's my idea of an airstream..."there was no road rage, officer, I just machined gunned the **B out of my way..."
Rapidly vanishing is correct. SuEllyn's Dad was at Normandy on D Day as a young soldier. SuEllyn's Dad turned 93 a week ago last Sunday. They are almost all gone. My dad was a B-17 copilot pretty late in WW II. Susie's dad was a B-17 waist gunner shot down in January 44 -- so malnourished on liberation that they told him not to expect fathering a child. Or six. We held his 89th birthday party last weekend. My uncle was a bombardier, earned a DFC in a B17. I have also attached a couple of photos of Aluminum Overcast's visit to the North Little Rock airport last summer. A nice side view and one of the nose bubble and bombsite where my uncle sat. 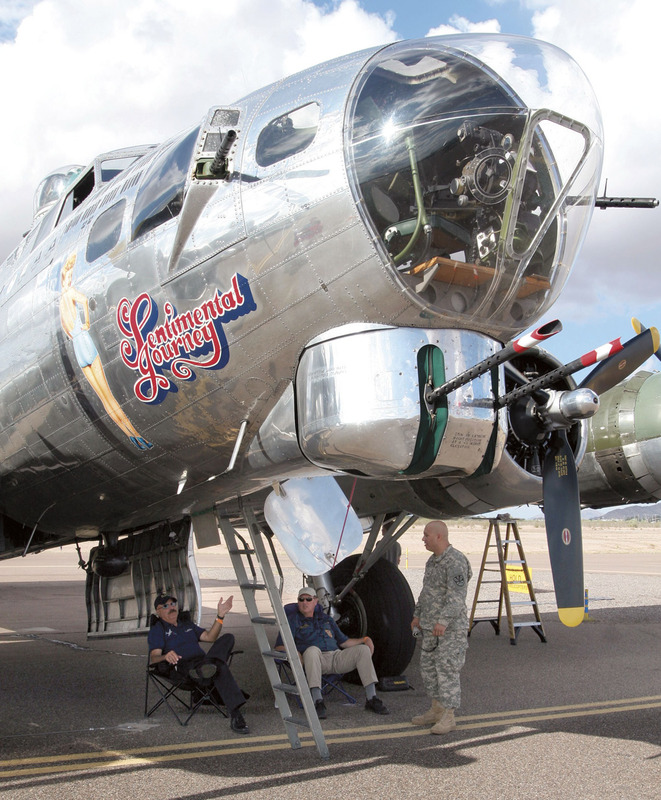 Also visiting that day was a former B17 navigator. Was a privilege to meet him. My wife's grandfather spent his time in Italy 1943-45 loading bombs onto these planes. Many years ago my wife and I joined her parents at an Airstream rally held at Oshkosh during the Experimental Aircraft Association (EAA) convention. It was amazing to stand next to my father-in-law (Claude Waite) as a B-17 cranked up. He was a co-pilot based out of England for 35 missions. As I watched him watching the plane, you could visibly see the years roll back and he was 19 again. His lips moved with the silent words of the checklists, and his fingers twitched as though touching the switches. It sent chills down my spin and will remain one of my fondest memories of him. God speed, Claude. To those of you reading this who fought in that or any war, thank you. Well, my Dad wasn't in a plane nor did he service one, but he was a tank Sgt. in the Army in Belgium/Germany/France in WWII. He had fallen from a tree and broke his back in the late '30's and was told he'd never work again. He did everything he was told to do for rehab, and when the war started, he had to talk them into allowing him to go fight over there. He now lives with us and will turn 94yrs. old 11/25 (born 1916!). He wasn't comfortable living alone any longer so four years ago we invited him to move in with us. He's doing great -- walks down our long driveway every morning to retrieve his paper (his exercise for the day). We are all fortunate that there have been those willing to fight for our freedom, it is now our turn to make certain their remaining years are the best they can be. I wondered, how many rivets are there in that plane. What a beautiful machinery and history. A lot like old Airstreams, beautiful machinery and history. Ever since i was a kid a B-17 has been so cool.. At the EAA Convention in Oshkosh I got to actually see and get in one. Then to stand next to that and about 10 ea. P-51's start up, taxi together and have a low level fly over was too much! You can keep your jet engines. Wow. How American ! Father was 15th Air Force B-17 top gunner/radio man.